Marine paints find application in vessels of all kinds from luxury yachts to sea going cargo and passenger ships, writes Kunal Bose. Therefore, sales and margins of marine paints manufacturers at a given period will necessarily be decided to a major extent by the outlook for shipbuilding industry, which now is principally concentrated in China, South Korea and Japan. India is also making strides to emerge as a shipbuilder of consequence. The world shipping industry has been in the dumps for a long while. But now in a report published on 30 April, Moody’s says the prospects for global shipping industry for the next 12 to 18 months have moved from negative to stable for the first time since 2011. At the same time, the report sounds the warning that the industry outlook could slip back to negative in case vessel supply exceeds demand by more than 2%. says coatings demand is to grow at a compound annual growth rate (CAGR) of 11.29% till 2018. One of the key factors to contribute to demand growth is the expected expansion of the oil and gas market. Oil and gas are the two growth engines of the world economy. At the same time, the report tells paints manufacturers to respond with speed to the growing consumer preference for eco-friendly products. Increasingly strict environmental regulations and more and more nations joining the global campaign to stop polluting the seas and save marine life will inevitably require of the marine paints industry to go on providing big funds for research and new products development. A member involved in preparation of the report is quoted as saying,“the increase in consumer preference for eco-friendly products is an important trend being witnessed in the global marine coatings market... Makers of marine coatings, which include anti-corrosive, anti-fouling and foul release products, are engaged in fine tuning and developing new and eco-friendly coatings to comply with increasingly strict regulations.” The industry is responding fairly well to make products that protect the marine ecosystem. The underlying message of the report is CAGR of 11.29% will be achievable provided the industry remains unrelenting in making environment friendly marine coatings in line with national and international regulations. Marine coatings are required to be designed with particular functionality properties to adequately protect and preserve the surfaces of vessels to which these are to be applied. At the same time, increasingly rigorous demand is made on coatings manufacturers to make products which will not foul marine environment but contribute to economy in fuel consumption. Margins of shipping companies remain under pressure even while bunker fuel prices are down to around $600 a tonne from a high of nearly $720 a tonne in February 2012. Ship owners have employed all possible means like slow streaming involving operating vessels at reduced engine power and substituting old fuel inefficient capacity by new generation fleet to cut their fuel bill. Even then better coating of outside bottom and sides of ships is required to trim fuel bill. For example, in case coatings are not found good enough to stop barnacles from latching onto ship hull, the inevitable result is slowdown of the vessels sending the fuel bill up by as much as 40%. So technologically superior and environment friendly paints that keep ship hulls barnacle-free offer two benefits. First, the shipping industry makes a considerable saving on fuel head. Second, because of less use of fuel, sea water and marine life will avoid the kind of assault of the past. Environmentalists say that as new age ships with ideal coatings will be carrying fewer barnacles than before, native species will not be threatened by foreign species. Responding to the demand of shipyards, Nippon Paint Marine Coatings introduced in April 2013 an ultra fuel saving type anti- fouling paint called A-LF-Sea, which is a marked improvement on the earlier LF-Sea type. Users of A-LF-Sea have confirmed that application of the coating leads to reduction in frictional resistance and therefore, of vessel fuel consumption and CO2 emissions. The other industry leaders like AkzoNobel, Jotun, Chugoku, Kansai and PPG Industries have in recent periods introduced market coatings that allow vessels to sail with less frictional resistance. AkzoNobel first asks the question as to what could be major expectations of shipbuilders and ship owners from paints suppliers and then gives the answers, obviously based on customer feedback. Customers will gravitate to those paint makers who will stand by their products through the life of a vessel. Equally importantly they want “an attractive end result — a paint job that’s durable, polished and professional looking.” The bottom-line in all cases is, however, the likely environmental impact of paint products. The friendlier they are environmentally, the better will be their marketability. American Coatings Association says the path-breaking development over the last few decades was the 2008 ban on organo tin tributyltin (TBT) compounds used as active ingredients in antifouling coatings. Copper-based coatings came as replacements. But soon concerns were expressed and rightly so over dissolved metal in bays and basins. This threw challenges to R&D centres of paints manufacturers to develop new sets of fouling protection coatings without any biocide. Progress in this direction is satisfactory. Take, for example, AkzoNobel’s Intersleek 1100SR fouling control system, which is the first biocide free foul release addressing the issue of slime fouling on ship hulls. The company claims that Intersleek delivers “macro and micro fouling control with improved static resistance even in warm waters and is suitable for slow steaming.” As the movement of the ship through water can release slime built up during static periods, the vessels achieves less drag leading to improvement in fuel efficiency and reduction in CO2 emissions. Thanks to AkzoNobel coming up with a breakthrough digital tool Intertrac, it is now possible to accurately assess the risk of hull fouling depending on journey routes of vessels. The company explains the tool is designed to “analyse various data systems” the results of which are then used to prepare the fouling risk profile of a vessel. Armed with such a profile, paints manufacturer will develop a “coatings system appropriate to a vessel’s specific route.” Such coatings will improve operational efficiencies and running costs of ships. Awaiting patents codification, Intertrac software divides the world’s oceans and coastal waters into 60 large marine ecosystems, each with its own fouling risk and characteristics, including salinity, temperature, thermal range, seasonality and typical ph levels. According to Conrad Keijzer, executive committee member at AkzoNobel responsible for performance coatings says “Interlac is a valuable tool enabling us to recommend optimal fouling control coating specifications which in turn generate major cost savings for customers.” Intertrac has created much excitement among shipbuilders and ship owners. In response to growing competition to sell coatings as shipyards continue to nurse much idle capacity, paints manufacturers are giving extra attention to marketing and brand building. From AkzoNobel to Norway’s Jotun, every industry leader has the realization that the best way to penetrate a market and then raise share of that market is to have local manufacturing facilities. So AkzoNobel is to be found making coatings in China, South Korea, Japan and India. European paints manufacturers have gone on expanding their production base in Asian countries in three ways — by creating subsidiaries, acquiring either local assets (factories) or local companies and forming joint ventures. “Vessels coatings are a high tech business and owners of such technologies are averse to parting with these. So their owners are necessarily keen to buy operational factories offshore or form JVs with management control,” says an official of Confederation of Indian Industry. China remains one of the foremost growth markets for paints manufacturers. For example, AkzoNobel, which is targeting a turnover of $3bn in China by 2015 has plans to allocate 15% or more of its global R&D budget to the Asian country in the next few years. Interestingly, the company’s R&D budget for China and India, where also AkzoNobel is highly active, is set to exceed that for Europe. The message that comes out loud and clear from Western marine paints manufacturers is that they must go on raising their manufacturing profile in Asia where shipbuilding and repairing capacity is concentrated. Jotun already had a share of 25% of Indian marine paints market built over two decades. Last year, it commissioned its manufacturing unit in India in the belief that this was the only way to improve its share of the local market growing at a healthy rate. Hempel was founded in Denmark in 1915 by Jørgen Christian Hempel. Driven by innovation and the vision of helping to protect man-made structures from corrosion and fouling, the company has developed and grown into a renowned coatings supplier working in the decorative, protective, marine, container and yacht markets. In 1917, Hempel introduced the world’s first antifouling coating for ships’ hulls based on modern science and technology. Today, Hempel is among the world leaders within antifouling and fouling release technology, and retains a close bond with the scientific community. “Hempel’s coatings cover a wide range of applications, from marine, oil and gas and power generation to infrastructure and light industry in almost every country in the world,” says Christian Ottosen, Group Marine Marketing Director. In the marine market, Hempel markets coatings to protect cargo holds and tanks, ballast tanks, topsides and superstructures as well as fouling control coatings for ships’ hulls. The company also supplies coatings for new containers. In the protective market Hempel supplies advanced protective coatings that add attractive and long-lasting protection to industrial structures. Hempel also offers coatings for the decorative market with a full range of solutions for both private homes and large building projects. Hempel is also a major force in yacht coatings and boat care products with a full range of products for pleasure and racing boats, from small motor boats to large racing yachts. “Hempel filed its first silicone patent in 1972 and the company’s first commercial silicone-based coating, HEMPASIL, was introduced in 1999, Ottosen relates. This pioneering product created a smooth, non-stick surface on the hull, preventing marine organisms from attaching to it. The result was less drag in the water, lower fuel consumption and lower CO2 emissions. Over the years, Hempel’s research and development lab continued to improve this technology by optimizing its long- term stability and mechanical properties, leading to HEMPASIL X3, Hempel’s flagship fouling release product with a fuel saving guarantee. Low demand due to the financial crisis and an over-capacity in the market left many shipping lines with a choice of lower rates or taking their vessels out of service. Many chose to adopt slow steaming. Others were forced into extended idle periods, in both cases making their vessels more vulnerable to fouling. “With continuously rising bunkering costs, the time had come for the next major fouling control technology shift, and Hempel grabbed the chance to take the lead,” Ottosen states. Hempel is committed to constant improvement of its performance with regard to energy efficiency and environmental impact. The development of ActiGuard® technology arose out of a wish to pursue an entirely new concept that would set the bar way above current standards. Fouling control was no longer enough. The goal now was a fouling defence solution that effectively protects against fouling throughout the service interval. Hempel’s new patented ActiGuard® technology introduces a new and unique way of producing an underwater hull coating containing a silicone-hydrogel that not only enables controlled biocide release, but also has the necessary long-term stability and mechanical properties. Hempel’s latest hull coating product, HEMPAGUARD®, is the first to be based on this patented technology, offering substantial economic and environmental advantages. HEMPAGUARD® — A NEW FOULING DEFENCE SOLUTION FROM HEMPEL — OFFERS UNIQUE SATISFACTION GUARANTEES Fleet operators have long wished for a fouling prevention solution that could deliver significant fuel savings over an entire docking interval. Hempel’s new, groundbreaking fouling defence coating using patented ActiGuard® technology is backed by unique performance guarantees and enables fuel savings, flexible trading and outstanding idle periods compared to standard antifouling. 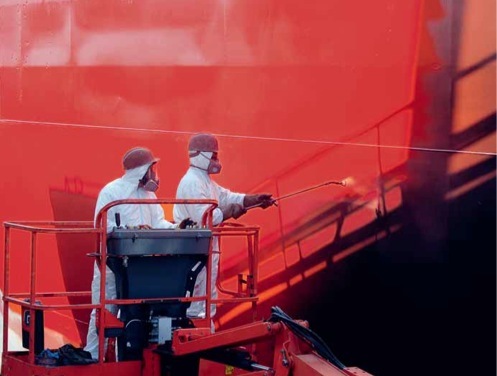 As bunkering costs rise, fleet operators are asking for more from their fouling defence coatings. At present, a majority of operators still prefer antifouling coatings to fouling release coatings due to doubts about the fuel efficiency performance of fouling release over an entire docking interval. Coatings help to increase fuel efficiency by maintaining a smooth surface that minimizes friction when sailing, or that deters fouling with the help of biocides. This is not difficult to achieve initially. The problems begin, however, after a relatively short period, especially in warmer waters and, in particular, during idle time. TheresultisHEMPAGUARD® usingActiGuard®,apatented new technology that enables a combination of a coating based on a special silicone hydrogel with controlled biocide diffusion, and an average decay of only 4% over the docking interval. According to Torben Rasmussen the effect is always the same, regardless of the trading pattern of the vessel and, in particular, when slow steaming or even during extended idling in aggressive waters. “We have succeeded in cracking a nut that has eluded other coating suppliers by developing hydrogel precursor polymers that can retain and release the biocide over an entire docking interval, “ Torben Rasmussen continues. HEMPAGUARD® releases 95% less biocide than a standard SPC. Moreover, the biocide is retained at the surface, thus eliminating the need for polishing as well as requiring only one coat compared with the two or three that are normally necessary in the case of antifouling. The surface has the same smoothness as conventional biocide-free silicone-based fouling release coatings. “HEMPAGUARD® is extremely flexible, eliminating the need to find a product suited to a particular sailing route, sailing speed or idle periods,” Torben Rasmussen underlines. “Our tests have shown that HEMPAGUARD® retains its effectiveness when switching between slow and fast steaming anywhere in the world as well as during extended idle periods. The development of HEMPAGUARD® started in 2008. During the development period, panels coated with conventional antifouling and fouling release were immersed in the warm waters of Singapore together with panels coated with HEMPAGUARD®. The results are extraordinarily good with immersed panels remaining virtually free from fouling for up to four years. “These results have led to a unique idle period guarantee of up to 120 days — more than four times as long as those offered by any other coatings supplier,” Skat-Rørdam explains. HEMPAGUARD® is recommended for all ship types whose owners wish to benefit from flexible trading, fuel savings and fouling defence at any speed or during idle periods. “We are committed to remaining focused on our goals, adaptable in a fast-changing world and quick to implement new ideas. We will strive to increase our understanding of our markets and customers, and offer innovative solutions that add value to their business,” Ottosen concludes.